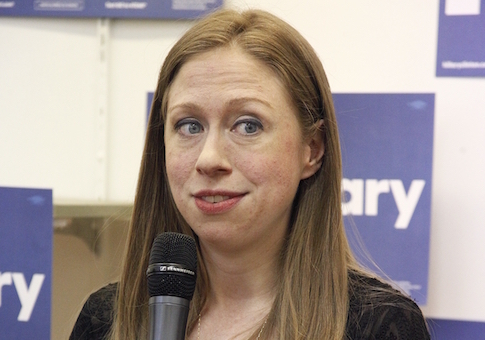 A watchdog group asked a federal court on Thursday to order the State Department to expedite its release of Chelsea Clinton-related records, arguing that at the current rate it would take the department 38 years to produce all the documents. Citizens United has been suing the State Department to turn over correspondence between department officials and Chelsea Clinton, who used the pseudonym "Diane Reynolds" in many of her emails. It is also asking for emails between State Department officials and the Clinton family’s long-time aides Amitabh Desai, Justin Cooper, and Oscar Flores. The D.C. district court ordered the State Department to release portions of the records to Citizens United on a rolling basis every four weeks, but did not specify an end date to complete the production. On June 1, the State Department said it had found nearly 4,000 documents responsive to the Citizens United request, but over the past two months it has released just 17 of them. "Thus, in the past two months, Defendant has produced only 17 documents out of a reported total of 3,924, and at a rate of only 127 pages per month," said Citizens United in the motion to modify the production order on Thursday. "At this rate, it would take Defendant more than 38 years to complete production to Plaintiff." The group asked the court to "modify its order of April 19, 2016, to require that, in each subsequent four-week document production, Defendant review at least 2,000 pages of documents for production to Plaintiff, producing all non-exempt documents." Citizens United says it is in the public’s interest to review correspondence between Chelsea Clinton and State Department officials before the presidential election, due to Chelsea’s senior role at the Clinton Foundation. Some emails between Hillary Clinton and Chelsea Clinton were released in an unrelated document production by the State Department. In one of these messages, Hillary told her daughter on the night of the Benghazi attack that it was carried out by an "al Qaeda-like group." The same night, Clinton released a statement suggesting that the coordinated terrorist attack was actually a spontaneous mob reaction to an anti-Islam YouTube video. For days after, the Obama administration continued to blame the attack on the video and downplay connections to terrorism. The email played a central role in the House Select Committee on Benghazi’s questions to Hillary Clinton during her public testimony last year. Citizens United president David Bossie accused the State Department of "slow-walking" the Chelsea Clinton documents in a statement to the Washington Free Beacon on Thursday. "38 years to produce emails is unacceptable for an administration and candidate that preach transparency," said Bossie. "Not surprisingly, the State Department is slow-walking the production of Chelsea Clinton’s emails with senior State Department officials." "As a senior officer of the Clinton Foundation, Chelsea Clinton’s communications with the State Department are of significant public importance because of the conflicts of interests that were created by these hopelessly intertwined relationships," he added. "The public has a right to inspect these emails before November." This entry was posted in Issues and tagged Chelsea Clinton, Hillary Clinton. Bookmark the permalink.